Kimberly Franklin: Award day! YAY! It appears that like many of you, I too have been hoarding all of my lovely blog awards. But.... I'm about to change that. Over the next two weeks I will pay forward some of my millions (five, to be exact) of blog awards to all of my blog buddies in the blogosphere (I so love that word! Even though my computer likes to tell me it isn't a word! Ha! What does my computer know?)!! You should be excited right now! Very, very excited! I received this awesome award from the very lovely and talented Summer. And, I absolutely love it! It gives me the warm and fuzzies. Thanks Summer! Be sure to check her blog out! She is super smart, a talented writer, and very, very funny!!! Anywho, there are no special rules for this award--except that you must pay it forward. 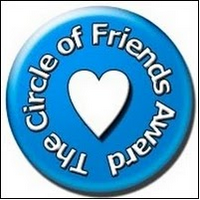 And the last award for the day is The Circle of Friends Award, given to me by one of my new besties, Kristin. Kristin is great! I literally talk with her (and Kristi) ALL DAY LONG! And we always talk about important things, you know? Like.... World Peace and Global Warming (Haha! If you believe that then you're crazier than I am!!) Sometimes I think (or know) that chatting with these lovely ladies is probably the only way I make it through my workday in one piece, while maintaining a sliver (very, very tiny sliver) of sanity (stop laughing!)! So, in honor of The Circle of Friends Award, I'm going to award this award (how many times can I say award in one sentence? Any guesses??) to some of my newest besties. I talk to these ladies at least once (or a hundred times) a day and truthfully they deserve all the awards for putting up with me. I don't know how I ever made it without them! Really, I don't?! And if you haven't checked out these blogs by now... well, shame on you! You just don't know what you're missing! I'll be back next week with two more of my millions (a whopping total of FIVE) awards to give away! I know, I know. You're probably hopping up and down in your seats with excitement, aren't you? Aw, thank you, thank you! And congrats on getting the awards yourself! Your blog is fantastic! Aw thanks Kimberly I love awards!!! Congrats on receiving them! Just so you know, your comment made my head swell so big that I now can't leave my office. Thank you so much! I will use it wisely, after staring at it for ten hours straight. Awww thanks!! LOL, now I have something else to create a crazy post with! I think your close to being named the Blog Award Queen. YAY for you and a exuberant CONGRATS to your recipients! I follow each and every one of you!! Anyway, I hope everyone has a Happy Tuesday! Thank you SO much for passing on this award to me! Congratulations to you on your much deserved million awards! I really enjoy your blog and your posts always brighten my day. Thank you! Kat - YOu're too kind! Congrats!! Jen - Thanks! Happy Tuesday!! Joanne & Kelly - Thanks! Happy Tuesday!! Mia - LOLOLOLOL! Congrats on your awward! I love, love, love that you are just excited about Twilight as I am. Now I'm not the only crazy one in this bunch. HAHA! 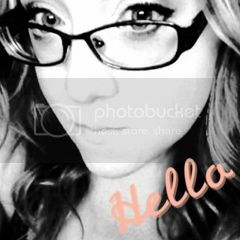 Ashley - Thanks! Have a great day! 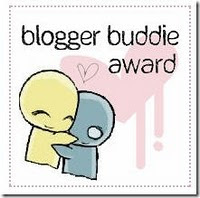 DL - You know what, after yesterday I kind of felt like the Blog Award Queen. So, since you brought it up, what do I get for being Blog Award Queen?!?!??? LOL. Chasing the Moon - Aw, I'm blushing over here. I'm glad my random silliness serves a purpose. : ) Congrats! Stop by my blog to pick it up! You are soooo my total blogger buddy! Merissa - You're the best!! Susan - Thanks! I hope you have a great night!! First of all, I CANNOT BELIEVE I MISSED THIS YESTERDAY!